"LAX" redirects here. For the song, see L.A. International Airport. For other uses, see LAX (disambiguation). Westchester, Los Angeles, California, U.S.
LAX is in the Westchester district of the city of Los Angeles, California, 18 miles (30 km) southwest of Downtown Los Angeles, with the commercial and residential areas of Westchester to the north, the city of El Segundo to the south and the city of Inglewood to the east. 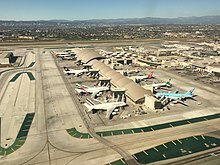 Owned and operated by Los Angeles World Airports (LAWA), an agency of the government of Los Angeles, formerly known as the Department of Airports, the airport covers 3,500 acres (1,400 ha) of land, LAX has four parallel runways. In 2018, LAX handled 87,534,384 passengers, making it the world's fourth busiest and the United States' second busiest airport following Hartsfield-Jackson Atlanta International Airport. As the largest and busiest international airport on the U.S. West Coast, LAX is a major international gateway to the United States, and also serves a connection point for passengers traveling internationally. The airport holds the record for the world's busiest origin and destination airport, since relative to other airports, many more travelers begin or end their trips in Los Angeles than use it as a connection. It is also the only airport to rank among the top five U.S. airports for both passenger and cargo traffic. LAX serves as a hub or focus city for more passenger airlines than any other airport in the United States. It is the only airport that four U.S. legacy carriers (Alaska, American, Delta, and United) have designated as a hub and is a focus city for Air New Zealand, Allegiant Air, Norwegian Air Shuttle, Qantas, Southwest Airlines, and Volaris. While LAX is the busiest airport in the Greater Los Angeles Area, several other airports, including Hollywood Burbank Airport, John Wayne Airport, Long Beach Airport, as well as Ontario International Airport, also serve the area. In 1928, the Los Angeles City Council selected 640 acres (1.00 sq mi; 260 ha) in the southern part of Westchester for a new airport. The fields of wheat, barley and lima beans were converted into dirt landing strips without any terminal buildings. It was named Mines Field for William W. Mines, the real estate agent who arranged the deal. The first structure, Hangar No. 1, was erected in 1929 and is in the National Register of Historic Places. Mines Field did not extend west of Sepulveda Boulevard; Sepulveda was rerouted circa 1950 to loop around the west ends of the extended east–west runways (now runways 25L and 25R), which by November 1950 were 6,000 feet (1,800 m) long. A tunnel was completed in 1953 allowing Sepulveda Boulevard to revert to straight and pass beneath the two runways; it was the first tunnel of its kind. For the next few years the two runways were 8,500 feet (2,600 m) long. Before the 1930s, existing airports used a two-letter abbreviation based on the weather stations at the airports. At that time, "LA" served as the designation for Los Angeles Airport. But with the rapid growth in the aviation industry the designations expanded to three letters c. 1947, and "LA" became "LAX." The letter "X" has no specific meaning in this identifier (just like the X in DXB - Dubai). "LAX" is also used for the Port of Los Angeles in San Pedro and by Amtrak for Union Station in downtown Los Angeles. The "Imperial Hill" area in El Segundo is a prime location for aircraft spotting, especially for takeoffs. Part of the Imperial Hill area has been set aside as a city park, Clutter's Park. Another popular spotting location sits under the final approach for runways 24 L&R on a lawn next to the Westchester In-N-Out Burger on Sepulveda Boulevard. This is one of the few remaining locations in Southern California from which spotters may watch such a wide variety of low-flying commercial airliners from directly underneath a flight path. At 12:51 p.m. on Friday, September 21, 2012, a Shuttle Carrier Aircraft carrying the Space Shuttle Endeavour landed at LAX on runway 25L. An estimated 10,000 people saw the shuttle land. Interstate 105 was backed up for miles at a standstill. Imperial Highway was shut down for spectators. It was quickly taken off the Shuttle Carrier Aircraft, a modified Boeing 747, and was moved to a United Airlines hangar. The shuttle spent about a month in the hangar while it was prepared to be transported to the California Science Center. The distinctive white googie Theme Building, designed by Pereira & Luckman architect Paul Williams and constructed in 1961 by Robert E. McKee Construction Co., resembles a flying saucer that has landed on its four legs. A restaurant with a sweeping view of the airport is suspended beneath two arches that form the legs. The Los Angeles City Council designated the building a Los Angeles Historic-Cultural Monument in 1992. A $4 million renovation, with retro-futuristic interior and electric lighting designed by Walt Disney Imagineering, was completed before the Encounter Restaurant opened there in 1997. Visitors are able to take the elevator up to the roof of the "Theme Building", which closed after the September 11, 2001 attacks for security reasons and reopened to the public on weekends beginning on July 10, 2010. Additionally, a memorial to the victims of the 9/11 attacks is located on the grounds, as three of the four hijacked planes were originally destined for LAX. 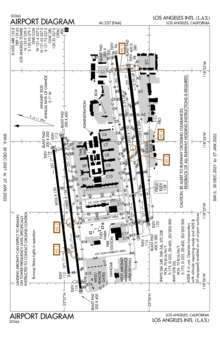 24R/06L and 24L/06R (designated the North Airfield Complex) are north of the airport terminals, and 25R/07L and 25L/07R (designated the South Airfield Complex) are south of the airport terminals. Since 1972, Los Angeles World Airports has adopted the "Preferential Runway Use Policy" to minimize noise. During daylight hours (0630 to 0000), the normal air traffic pattern is the "Westerly Operations" plan, named for the prevailing west winds. Under "Westerly Operations", departing aircraft take off to the west, and arriving aircraft approach from the east. To reduce noise from arriving aircraft during night hours (0000 to 0630), the air traffic pattern becomes "Over-Ocean Operations". Under "Over-Ocean", departing aircraft continue to take off to the west, but arriving aircraft approach from the west unless otherwise required to approach from the east due to reduced visibility or easterly winds. As the name implies, "Easterly Operations" is used when prevailing winds have shifted to originate from the east, typically during inclement weather and Santa Ana conditions. Under "Easterly Operations", departing aircraft take off to the east, and arriving aircraft approach from the west. The "inboard" runways (06R/24L and 07L/25R, closest to the central terminal area) are preferred for departures, and the "outboard" runways are preferred for arrivals. During noise-sensitive hours (2200 to 0700) and "Over-Ocean Operations", the "inboard" runways are used preferentially, with arrivals shifting primarily to 06R/24L and departures from 07L/25R. Historically, over 90% of flights have used the "inboard" departures and "outboard" arrivals scheme. During westbound operations during the daytime, airplanes parked on the north complex tend to use Runway 6R/24L for almost all departures, and airplanes parked on the south complex use Runway 7L/25R for all departures requiring the left turn, and Runway 24L if they are making an immediate right turn. For arrivals, flights coming from the north tend to use Runway 6L/24R, and flights coming from the south tend to use Runway 7R/25L. For flights having a long final westbound, it could depend. The South Airfield Complex tends to see more operations than the North, due to a larger number of passenger gates and air cargo operations. Runways in the North Airfield Complex are separated by 700 feet (210 m). Plans have been advanced and approved to increase the separation by 260 feet (79 m), which would allow a central taxiway between runways, despite opposition from residents living north of LAX. The separation between the two runways in the South Airfield Complex has already increased by 55 feet (17 m) to accommodate a central taxiway. LAX has nine passenger terminals with a total of 128 gates arranged in the shape of the letter U or a horseshoe. The terminals are served by a shuttle bus. The Tom Bradley International Terminal and Terminals 4, 5, 6, 7, and 8 are all connected airside via an overground passage between Terminal 4 and the Tom Bradley International Terminal, an underground tunnel between Terminals 4, 5, and 6 and above-ground walkways between Terminals 6, 7, and 8. Additional airside shuttle buses operate among Terminals 4, 6, and the American Eagle remote terminal, as well as between Terminals 2, 3, and the Tom Bradley International Terminal. There are no physical airside connections between any of the other terminals. In addition to these terminals, there are 2,000,000 square feet (190,000 m2) of cargo facilities at LAX, and a heliport operated by Bravo Aviation. 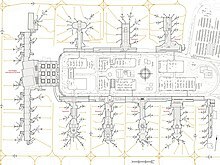 LAX diagram showing runways and terminals. Terminal 1 (Gates 9, 10, 11A-11B, 12A-12B, 13-15, 16A, and 17A-17B): Southwest. Southwest uses Terminal 1 for international check-in of passengers. Terminal 2 (Gates 21–21B, 22–22A, 23-23A, 24–24A, and 25–28): Delta and Delta Connection along with Aer Lingus, Aeroméxico, and Virgin Atlantic. Terminal 3 (Gates 30, 31A–31B, 32, 33A–33B, 34–36, 37A–37B, and 38): Delta, Delta Connection, and WestJet. Copa Airlines, Avianca, Virgin Australia and Interjet use Terminal 3 for check-in of passengers. 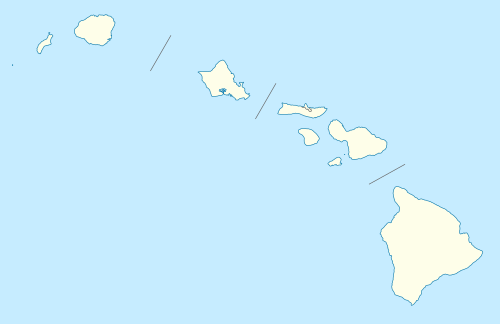 Terminal 6 (Gates 60–63, 64A–64B, 65A-65B, 66, 67, 68A–68B, and 69A–69B): Alaska Airlines, Air Canada, Boutique Air, Mokulele Airlines, Thomas Cook Airlines, VivaAerobus, and XL Airways France. Tom Bradley International Terminal (TBIT) (Gates 101-159): Aeroflot, Air China, Air France, Air Italy, Air New Zealand, Air Tahiti Nui, Alitalia, All Nippon Airways, Asiana Airlines, Austrian Airlines, British Airways, Cathay Pacific, China Airlines, China Eastern Airlines, China Southern Airlines, EVA Air, El Al, Emirates, Etihad Airways, Fiji Airways, Finnair, Hainan Airlines, Hong Kong Airlines, Iberia, Japan Airlines, KLM, Korean Air, LATAM Chile, LATAM Perú, LOT Polish Airlines, Lufthansa, Norwegian Air Shuttle, Philippine Airlines, Qantas, Qatar Airways, Saudia, Scandinavian Airlines, Sichuan Airlines, Singapore Airlines, Swiss International Air Lines, Turkish Airlines, and XiamenAir uses TBIT for check-in of passengers. 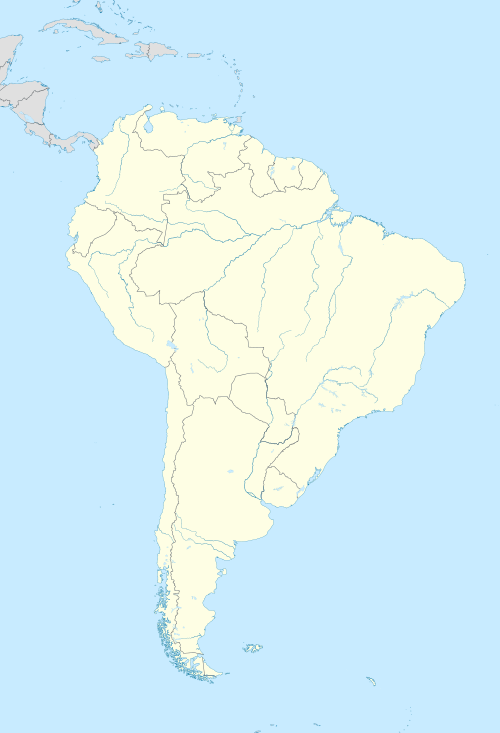 Avianca, Copa Airlines, Interjet, Virgin Australia, and Volaris use TBIT for arrivals and departures. ^ Qantas also flies to/from New York–JFK, but only for international, connecting traffic. Due to U.S. federal law, foreign airlines may not transport revenue passengers solely between U.S. destinations. It is the world's fourth-busiest airport by passenger traffic and eleventh-busiest by cargo traffic, serving over 87 million passengers and 2 million tons of freight and mail in 2014. It is the busiest airport in the state of California, and the second-busiest airport by passenger boardings in the United States. In terms of international passengers, the second busiest airport for international traffic in the United states, behind only JFK in New York City. The number of aircraft movements (landings and takeoffs) was 700,362 in 2017, the third most of any airport in the world. A number of international carriers shown at Tom Bradley International Terminal. Shuttles operate to and from the terminals, providing frequent service for connecting passengers. However, connecting passengers who use these shuttles must leave and then later reenter security. Underground tunnels connect between terminals 4, 5, 6, 7, and 8, and an above-ground connector between TBIT and terminal 4 opened in February 2016. 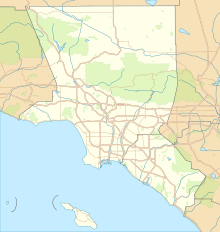 LAX's terminals are immediately west of the interchange between Century Boulevard and Sepulveda Boulevard (State Route 1). The 405 Freeway can be reached to the east via Century Boulevard, and the 105 Freeway can be reached to the south via Sepulveda Boulevard. Sepulveda Boulevard also goes right under the airport runways. The closest bus stops to the terminals are the pair of opposites on Sepulveda Boulevard and Century Boulevard, served by Metro 117, Torrance 8, Metro 232, Commuter Express 574 and Metro 40 to Los Angeles Union Station (owl service only). In addition, out of a number of bus systems, many routes (local, rapid and express) of the LACMTA Metro 232 to Long Beach, Line 8 of Torrance Transit, Line 109 of Beach Cities Transit, the Santa Monica Big Blue Bus system's Line 3 and Rapid 3 via Lincoln Boulevard to Santa Monica and the Culver CityBus's Line 6 and Rapid 6 via Sepulveda Blvd to Culver City and UCLA, LADOT Commuter Express 438 to Downtown LA (Monday-Friday Rush hours AM), all make stops at the LAX Transit Center in Parking Lot C. on 96th St., where shuttle bus "C" offers free connections to and from every LAX terminal, and at the Green Line, where shuttle bus "G" connects to and from the terminals. The Taiwanese airline China Airlines operates a bus service from LAX to Monterey Park and Rowland Heights. This service is only available for China Airlines customers. 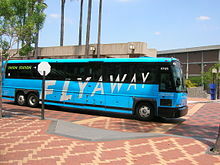 The FlyAway Bus is a nonstop motorcoach/shuttle service run by the LAWA, which provides scheduled service between LAX and Downtown Los Angeles (Union Station), the San Fernando Valley (Van Nuys), West Los Angeles (Westwood), Hollywood, Long Beach, and Santa Monica was discontinued in 2015. The Irvine FlyAway was discontinued on August 31, 2012. The shuttle service stops at every LAX terminal. The service hours vary based on the line. All lines use the regional system of High Occupancy Vehicle lanes to expedite their trips. The Los Angeles Union Station service and a late-night branch of Metro Local route 40 are the only direct transport links between the airport and Downtown Los Angeles. Shuttle bus "G" offers a free connection to and from the Aviation/LAX station on the Los Angeles Metro Rail Green Line. The line was originally intended to be a people mover to connect directly to the airport terminals, but budgetary restraints and opposition from local taxi and parking lot owners impeded its progress and won. An automated people mover (APM) system is an under construction train by LAWA. The LAX APM will have six stations and be 2.25 miles in traveling distance: three stations serving the central area, terminals 1-8 and the Tom Bradley International Terminal. Heading east, one station serving a ground transportation hub called the Intermodal Transportation Facility-West along with the surrounding hotels. The next station will be a three level above ground infill transit hub on the LAX/Crenshaw Metro Line. At this station, the first level will be a second car/bus/bike transport facility called the Intermodal Transport Facility-East as well as LA Metro Rail's platform. The second level will be a bridge from the main hub to the light rail and APM platforms with fare gates. The third level will be the APM. The last stop will be a rental car hub station called the Consolidated Rent-A-Car-Center (CONRAC). The APM was designed to decrease the need for shuttle bus services and reduce traffic within World Way. The three phase project is estimated to cost $5.5 billion, and have a completion date of 2023. The APM will have nine total trains, each operating in four car sets with capacity of containing up to 200 passengers. The APM will operate every two minutes, with a ten minute end-to-end travel time. As plans were being finalized, in June 2014, the Los Angeles County Metropolitan Transportation Authority approved a $200 million Metro Rail infill station called Aviation/96th Street on the under construction Crenshaw/LAX Line to connect the APM, connecting the terminals to county wide rail system. Los Angeles had bid for the 2024 Olympic games in 2016 and was one of two city finalists, due to decreasing demand to host the Olympics, the IOC awarded both Los Angeles and the city of Paris with Olympic games each, Los Angeles being awarded the latter, the 2028 Summer Olympics games. The project will be completed in time for the 2028 Summer Olympics in 2023 as its original projected completion date was by 2024 before the awarding. They choose to retain the original deadline. LAWA has split the project in three phases. The project has been approved and the construction and operating bidding process was commenced. Three firms submitted bids and LAWA announced scoring for the project would be based on "technical merit, visual appeal, user experience and price". LAWA proposed a public private partnership wherein a private sector partner would responsible for the construction and operation of the people mover. Los Angeles City Council gave final approval on April 11, 2018 to "LAX Integrated Express Solutions". The joint bid that included manufacturer Bombardier Transportation at 4.895 Billion over 30 years to build and operate. Dallas based building firm Austin Commercial was awarded a five year contract to commence construction in the first quarter of 2018 on phase one of the APM project. The project consists of bridges to connect passengers between the three proposed APM stations inside World Way and the terminals. The bridges will also house restrooms, Airport lounges offices and other spaces. The project is expected to finish by 2021, followed by phases two and three that will consist of the people mover and off site buildings. In January 2018, a consortium led by Hochtief and Bombardier Transportation was selected as the preferred developer to be awarded the $1.95 billion design/build/operate contract. In 2018, 2,100 parking spaces in lot C were removed to reconfigure the area for phase two construction purposes. Utility relocation started in the second quarter of 2018. The guideway will see construction in early 2019, taking up to three years to complete. Groundbreaking was held in March 2019. Taxicab services are operated by nine city-authorized taxi companies and regulated by Authorized Taxicab Supervision Inc. (ATS). ATS maintains a taxicab holding lot under the 96th Street Bridge where, at peak periods, hundreds of cabs queue up to wait their turn to pull into the central terminal area to pick up passengers. A number of private shuttle companies also offer limousine and bus services to LAX Airport. Uber and Lyft both provide ride services to and from LAX. All dropoffs and pickups happen on the upper departures level. Pickups (arriving passengers) only happen at one of the designated "rideshare signs." There are six rideshare sign locations around the airport, labeled A thru F. Lyft and Uber drivers are not allowed on the lower arrivals area, except when picking up a disabled passenger who requires ADA access. Uber and Lyft drivers must have a valid LAX placard displayed on the passenger side of their vehicle's inside front windshield or dashboard. The airport also functioned as a joint civil-military facility, providing a base for the United States Coast Guard and its Coast Guard Air Station Los Angeles facility, operating four HH-65 Dolphin helicopters, which covers Coast Guard operations in various Southern California locations, including Catalina Island. Missions include search and rescue (SAR), law enforcement, aids to navigation support (such as operating lighthouses) and various military operations. In addition, Coast Guard helicopters assigned to the air station deploy to Coast Guard cutters. The air station relocated by May 18, 2016 from LAX to accommodate the planned improvements for LAX's midfield, including the Midfield Satellite Concourse North (MSC North) terminal. 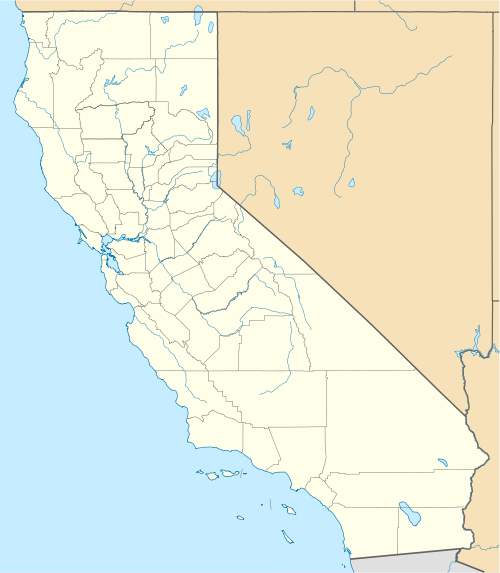 The air station moved to U.S. Navy's Naval Air Station Point Mugu, part of the Naval Base Ventura County (NBVC) in Point Mugu. The Flight Path Learning Center is a museum located at 6661 Imperial Highway and was formerly known as the "West Imperial Terminal". This building used to house some charter flights (e.g. Condor Airlines, Martinair Holland, World Airways) and regular scheduled flights by MGM Grand Air. It sat empty for 10 years until it was re-opened as a learning center for LAX. The center contains information on the history of aviation, several pictures of the airport, as well as aircraft scale models, flight attendant uniforms, and general airline memorabilia such as playing cards, china, magazines, signs, even a TWA gate information sign. The museum also offers school tours and a guest speaker program. The museum's library contains an extensive collection of rare items such as aircraft manufacturer company newsletters/magazines, technical manuals for both military and civilian aircraft, industry magazines dating back to World War II and before, historic photographs and other invaluable references on aircraft operation and manufacturing. The museum has on display "The Spirit of Seventy-Six," which is a DC-3 (DC-3-262, Serial No. 3269). After being in commercial airline service, the plane served as a corporate aircraft for Union Oil Company for 32 years. The plane was built in the Douglas Aircraft Company plant in Santa Monica in January 1941, which was a major producer of both commercial and military aircraft. The museum claims to be "the only aviation museum and research center situated at a major airport and the only facility with a primary emphasis on contributions of civil aviation to the history and development of Southern California". There are other museums at major airports, however, including the Udvar-Hazy Center of the National Air and Space Museum adjacent to Washington Dulles Airport, the Royal Thai Air Force Museum at Don Mueang Airport, the Suomen ilmailumuseo (Finnish Aviation Museum) at Helsinki-Vantaa Airport, the Frontiers of Flight Museum at Dallas Love Field, the Tulsa Air and Space Museum & Planetarium at Tulsa International Airport and others. The airport has the administrative offices of Los Angeles World Airports. Continental Airlines once had its corporate headquarters on the airport property. At a 1962 press conference in the office of Mayor of Los Angeles Sam Yorty, Continental Airlines announced that it planned to move its headquarters to Los Angeles in July 1963. In 1963 Continental Airlines headquarters moved to a two-story, $2.3 million building on the grounds of the airport. The July 2009 Continental Magazine issue stated that the move "underlined Continental Airlines western and Pacific orientation". On July 1, 1983 the airline's headquarters were relocated to the America Tower in the Neartown area of Houston. In addition to Continental Airlines, Western Airlines and Flying Tiger Line also had their headquarters at LAX. On January 23, 1939, the sole prototype Douglas 7B twin-engine attack bomber, designed and built as a company project, suffered a loss of the vertical fin and rudder during a demonstration flight over Mines Field, flat spun into the parking lot of North American Aviation, and burned. Another source states that the test pilot, in an attempt to impress the Gallic passenger, attempted a snap roll at low altitude with one engine feathered, resulting in the fatal spin. Douglas test pilot Johnny Cable bailed out at 300 feet, his chute unfurled but did not have time to deploy, he was killed on impact, the flight engineer John Parks rode in the airframe and died, but 33-year-old French Air Force Capt. Paul Chemidlin, riding in the aft fuselage near the top turret, survived with a broken leg, severe back injuries, and a slight concussion. The presence of Chemidlin, a representative of a foreign purchasing mission, caused a furor in Congress by isolationists over neutrality and export laws. The type was developed as the Douglas DB-7. On June 1, 1940, the first Douglas R3D-1 for the U.S. Navy, BuNo 1901, crashed at Mines Field, before delivery. The Navy later acquired the privately owned DC-5 prototype, from William E. Boeing as a replacement. On November 20, 1940, the prototype NA-73X Mustang, NX19998, first flown October 26, 1940, by test pilot Vance Breese, crashed this date. According to P-51 designer Edgar Schmued, the NA-73 was lost because test pilot Paul Balfour refused, before a high-speed test run, to go through the takeoff and flight test procedure with Schmued while the aircraft was on the ground, claiming "one airplane was like another". After making two high speed passes over Mines Field, he forgot to put the fuel valve on "reserve" and during the third pass ran out of fuel. An emergency landing in a freshly plowed field caused the wheels to dig in, the aircraft flipped over, the airframe was not rebuilt, the second aircraft being used for subsequent testing. On October 26, 1944, WASP pilot Gertrude Tompkins Silver of the 601st Ferrying Squadron, 5th Ferrying Group, Love Field, Dallas, Texas, departed Los Angeles Airport, in a North American P-51D Mustang, 44-15669, at 1600 hrs PWT, headed for the East Coast. She took off into the wind, into an offshore fog bank, and was expected that night at Palm Springs. She never arrived. Due to a paperwork foul-up, a search did not get under way for several days, and while the eventual search of land and sea was massive, it failed to find a trace of Silver or her plane. She is the only missing WASP pilot. She had married Sgt. Henry Silver one month before her disappearance. On January 13, 1969, Scandinavian Airlines System Flight 933 Douglas DC-8-62, crashed into Santa Monica Bay, approximately 6 nautical miles (11 km) west of LAX at 7:21 pm, local time. The aircraft was operating as flight SK-933, nearing the completion of a flight from Seattle. Of nine crewmembers, three lost their lives to drowning, while 12 of the 36 passengers also drowned. On January 18, 1969, United Airlines Flight 266 a Boeing 727-200 bearing the registration number N7434U, crashed into Santa Monica Bay approximately 11.3 miles (18.2 km) west of LAX at 6:21 pm local time. The aircraft was destroyed, resulting in the loss of all 32 passengers and six crew members aboard. On the evening of June 6, 1971, Hughes Airwest Flight 706, a Douglas DC-9 jetliner that had departed LAX on a flight to Salt Lake City, Utah, was struck nine minutes after takeoff by a U.S. Marine Corps McDonnell Douglas F-4 Phantom II fighter jet over the San Gabriel Mountains. The midair collision killed all 44 passengers and five crew members aboard the DC-9 airliner and one of two crewmen aboard the military jet. On August 6, 1974, a bomb exploded near the Pan Am ticketing area at Terminal 2; three people were killed and 35 were injured. On March 1, 1978, two tires burst in succession on a McDonnell Douglas DC-10-10 on Continental Airlines Flight 603 during its takeoff roll at LAX and the plane, bound for Honolulu, veered off the runway. A third tire burst and the DC-10's left landing gear collapsed, causing a fuel tank to rupture. Following the aborted takeoff, spilled fuel ignited and enveloped the center portion of the aircraft in flames. During the ensuing emergency evacuation, a husband and wife died when they exited the passenger cabin onto the wing and dropped down directly into the flames. Two additional passengers died of their injuries approximately three months after the accident; 74 others aboard the plane were injured, as were 11 firemen battling the fire. On the evening of March 10, 1979, Swift Aire Flight 235, a twin-engine Aerospatiale Nord 262A-33 turboprop en route to Santa Maria, was forced to ditch in Santa Monica Bay after experiencing engine problems upon takeoff from LAX. The pilot, co-pilot and a female passenger drowned when they were unable to exit the aircraft after the ditching. The female flight attendant and the three remaining passengers—two men and a pregnant woman—survived and were rescued by several pleasure boats and other watercraft in the vicinity. On August 31, 1986, Aeroméxico Flight 498, a DC-9 en route from Mexico City, Mexico to Los Angeles, began its descent into LAX when a Piper Cherokee collided with the DC-9's left horizontal stabilizer over Cerritos, causing the DC-9 to crash into a residential neighborhood. All 67 people on the two aircraft were killed, in addition to 15 people on the ground. 5 homes were destroyed and an additional 7 were damaged by the crash and resulting fire. The Piper went down in a nearby schoolyard and caused no further injuries on the ground. As a result of this incident, the FAA required all commercial aircraft to be equipped with Traffic Collision Avoidance System (TCAS). On February 1, 1991, USAir Flight 1493 (arriving from Columbus, Ohio), a Boeing 737-300, landing on runway 24L at LAX, collided on touchdown with a SkyWest Airlines Fairchild Metroliner, Flight 5569 departing to Palmdale. The Skywest plane was given clearance to wait on the runway for takeoff. The same controller then gave the USAir plane clearance to land on the same runway, forgetting that the SkyWest plane was there. The collision killed all 12 occupants of the SkyWest plane and 23 people aboard the USAir 737. Al-Qaeda attempted to bomb LAX on New Year's Eve 1999/2000. The bomber, Algerian Ahmed Ressam, was captured in Port Angeles, Washington, the U.S. port of entry, with a cache of explosives that could have produced a blast 40 times greater than that of a car bomb hidden in the trunk of the rented car in which he had traveled from Canada. He had planned to leave one or two suitcases filled with explosives in an LAX passenger waiting area. He was initially sentenced to 22 years in prison, but in February 2010 an appellate court ordered that his sentence be extended. On January 31, 2000, Alaska Airlines Flight 261, a McDonnell Douglas MD-83 jetliner flying from Puerto Vallarta, Mexico to San Francisco and Seattle, requested an emergency landing at LAX after experiencing problems with its tail-mounted horizontal stabilizer. Before the plane could divert to Los Angeles, it suddenly plummeted into the Pacific Ocean approximately 2.7 miles (4.3 km) north of Anacapa Island off the California coast, killing all 88 people aboard. Three of the four planes hijacked on September 11, 2001 were bound for LAX. In the 2002 Los Angeles International Airport shooting of July 4, 2002, Hesham Mohamed Hadayet killed two Israelis at the ticket counter of El Al Airlines at LAX. Although the gunman was not linked to any terrorist group, the man was upset at U.S. support for Israel, and therefore was motivated by political disagreement. This led the FBI to classify this shooting as a terrorist act, one of the few on U.S. soil since the September 11 attacks. On September 21, 2005, JetBlue Flight 292, an Airbus A320 discovered a problem with its landing gear as it took off from Bob Hope Airport in Burbank. It flew in circles for three hours to burn off fuel, then landed safely at Los Angeles International Airport on runway 25L, balancing on its back wheels as it rolled down the center of the runway. Passengers were able to watch their own coverage live from the satellite broadcast on JetBlue in-flight TV seat displays of their plane as it made an emergency landing with the front landing gear visibly becoming damaged. Because JetBlue did not serve LAX at the time, the aircraft was evaluated and repaired at a Continental Airlines hangar. On July 29, 2006, after America West Express Flight 6008, a Canadair Regional Jet operated by Mesa Airlines from Phoenix, Arizona, landed on runway 25L, controllers instructed the pilot to leave the runway on a taxiway known as "Mike" and stop short of runway 25R. Even though the pilot read back the instructions correctly, he accidentally taxied onto 25R and into the path of a departing SkyWest Airlines Embraer EMB-120 operating United Express Flight 6037 to Monterey. They cleared each other by 50 feet (15 m) and nobody was hurt. On August 16, 2007, a runway incursion occurred between WestJet Flight 900 and Northwest Airlines Flight 180 on runways 24R and 24L, respectively, with the aircraft coming within 37 feet (11 m) of each other. The planes were carrying a combined total of 296 people, none of whom were injured. The NTSB concluded that the incursion was the result of controller error. In September 2007, FAA Administrator Marion Blakey stressed the need for LAX to increase lateral separation between its pair of north runways in order to preserve the safety and efficiency of the airport. On October 13 and 14, 2013, two incidents of dry ice bomb explosions occurred at the airport. The first dry ice bomb exploded at 7:00 p.m. in an employee restroom in Terminal 2, with no injuries. Terminal 2 was briefly shut down as a result. On the next day at 8:30 p.m., a dry ice bomb exploded on the ramp area near the Tom Bradley International Terminal, also without injuries. Two other plastic bottles containing dry ice were found at the scene during the second explosion. On October 15, a 28-year-old airport employee was arrested in connection with the explosions and was booked on charges of possession of an explosive or destructive device near an aircraft. He is currently held on a $1 million bail. On October 18, a 41-year-old airport employee was arrested in connection with the second explosion, and was booked on suspicion of possessing a destructive device near an aircraft. Authorities believe that the incidents are not linked to terrorism. In the 2013 Los Angeles International Airport shooting of November 1, 2013, at around 9:31 a.m. PDT, a lone gunman entered Terminal 3 and opened fire with a semi-automatic rifle, killing a Transportation Security Administration (TSA) officer and wounding three other people. The gunman was later apprehended and taken into custody. Until the situation was clarified and under control, a few terminals at the airport were evacuated, all inbound flights were diverted and all outbound flights were grounded until the airport began returning to normal operation at around 2:30 p.m.
On August 28, 2016, there was a false report of shots fired throughout the airport, causing a temporary lock down and about 3 hours of flight delays. On May 20, 2017, Aeroméxico Flight 642, a Boeing 737-800, collided with a utility truck on a taxiway near Runway 25R, injuring 8 people, two of them seriously. LAWA currently has several plans to modernize LAX. These include terminal and runway improvements, which will enhance the passenger experience, reduce overcrowding, and provide airport access to the latest class of very large passenger aircraft. A 24-hour automated people mover is under construction. This small train will include three stations in the central terminal area and three outside east of the terminals at a new intermodal transportation facility hub, connecting passengers between the central terminal area and the Metro Green Line, the future Metro Crenshaw/LAX Line regional and local bus lines and a consolidated car rental facility. Numerous films and television shows have been set or filmed partially at LAX, at least partly due to the airport's proximity to Hollywood studios and Los Angeles. Film shoots at the Los Angeles airports, including LAX, produced $590 million for the Los Angeles region from 2002 to 2005. ^ "Cities served - Alaska Airlines". Newsroom - Alaska Airlines. Alaska Airlines. September 2016. Retrieved October 15, 2016. With hubs in Anchorage, Alaska, Los Angeles and Portland, Oregon; Alaska calls Seattle home. The carrier offers more nonstop flights from Seattle than any other carrier. ^ "Delta Hub Station Los Angeles". January 12, 2016. Retrieved January 12, 2016. ^ a b "Los Angeles International airport – Economic and social impacts". Ecquants. Archived from the original on May 22, 2014. Retrieved September 7, 2013. ^ a b FAA Airport Master Record for LAX (Form 5010 PDF). Retrieved March 15, 2007. ^ "Los Angeles World Airports (LAWA) - Traffic Comparison (TCOM) - Los Angeles International Airport - Calendar YTD January to December" (PDF). Lawa.org. Retrieved February 13, 2017. ^ "Statistics". Los Angeles World Airports. January 2016. Retrieved July 12, 2016. ^ "Airport Traffic Reports". Airports Council International – North America. Archived from the original on November 3, 2012. Retrieved August 19, 2012. ^ "Aviation Facilities Company, Inc. :: Properties :: LAX". Afcoinc.com. Archived from the original on July 7, 2011. Retrieved December 6, 2010. ^ "LAX Early History". Los Angeles World Airports. Retrieved October 25, 2011. ^ "LAX – Airport Information – General Description – Just the Facts". Lawa.org. Retrieved December 6, 2010. ^ a b "Search history". Los Angeles World Airports. Archived from the original on September 24, 2005. Retrieved March 21, 2008. ^ "backwards 1939 aerial view". Digitallibrary.usc.edu. Retrieved August 13, 2013. ^ "USC Libraries Digital Collections". Digitallibrary.usc.edu. Retrieved April 28, 2016. ^ "LAX Frequently Asked Questions". Los Angeles World Airports. Retrieved January 28, 2010. ^ "Space Shuttle Endeavour Comes Home to Los Angeles". Dryden Flight Research Center. September 21, 2012. Retrieved October 15, 2012. ^ Eddie Sotto (August 6, 2001). "Encounter at the Theme Building". LaughingPlace.com (Interview). Interviewed by Marc Borrelli. Retrieved February 25, 2008. ^ "Iconic LAX Theme Building ready for its close-up". KPCC. July 2, 2010. Retrieved July 2, 2010. ^ "Art Program – LAX 9/11 Memorial". Lawa.org. September 11, 2001. Retrieved August 13, 2013. ^ a b c Environmental Services Division, Noise Management Section (April 11, 2014). Los Angeles International Airport - Preferential Runway Use Policy (PDF) (Report). Los Angeles World Airports. Archived from the original (PDF) on August 16, 2017. Retrieved August 15, 2017. ^ Oldham, Jennifer (June 5, 2007). "Pilots seek greater separation between LAX north runways". Los Angeles Times. Retrieved August 16, 2017. ^ Weikel, Dan (December 3, 2012). "LAX runway separation plan advances, over groups' objections". Los Angeles Times. Retrieved August 16, 2017. ^ Oldham, Jennifer (November 28, 2006). "North runways at LAX may be altered". Los Angeles Times. Retrieved August 16, 2017. ^ Weikel, Dan (April 30, 2013). "Council OKs moving LAX runway as part of $4.76-billion upgrade". Los Angeles Times. Retrieved August 16, 2017. ^ "Online timetable". Aeroflot. Retrieved August 4, 2018. ^ a b "Flight Schedule". Retrieved August 4, 2018. ^ "Flight Timetable". Retrieved August 4, 2018. ^ "Air Italy flight timetable". Air Italy. ^ "Flight schedules - Air New Zealand". Retrieved August 4, 2018. ^ "Flight Schedule". Retrieved August 4, 2018. ^ "FLIGHT SCHEDULE AND OPERATIONS". Retrieved August 4, 2018. ^ "Timetables [International Routes]". Retrieved August 4, 2018. 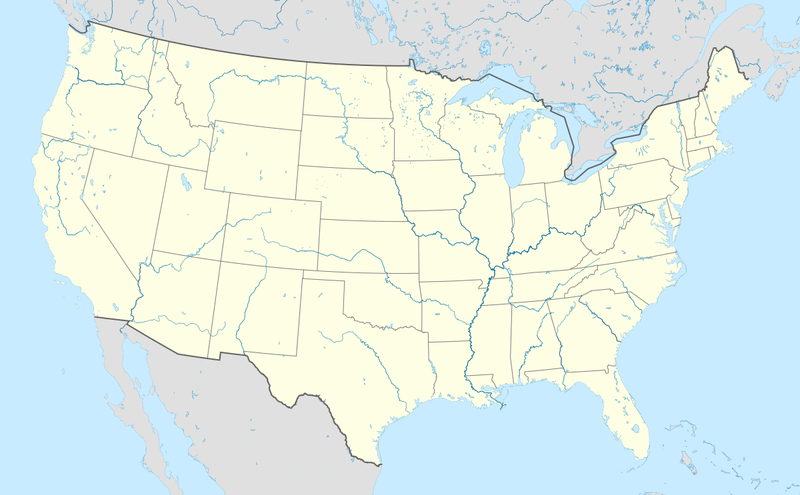 ^ "Allegiant Interactive Route Map". Retrieved August 4, 2018. ^ a b "Flight schedules and notifications". Retrieved August 4, 2018. ^ "Routes of Service". Archived from the original on March 17, 2018. Retrieved August 4, 2018. ^ a b c "Check itineraries". Retrieved August 4, 2018. ^ "Route Map and Schedule". Retrieved August 4, 2018. ^ "Timetable | China Airlines". Retrieved August 4, 2018. ^ "Schedules and Timetable". China Eastern Airlines. Archived from the original on June 23, 2018. Retrieved August 5, 2018. ^ "Timetable". Retrieved August 4, 2018. ^ a b "FLIGHT SCHEDULES". Retrieved August 4, 2018. ^ "Route Map". Retrieved August 8, 2018. ^ "Finnair to fly new A350 route to Los Angeles in 2019". finnair.com. August 2018. Retrieved August 21, 2018. ^ "Frontier". Retrieved August 4, 2018. ^ "Destinations". Retrieved August 4, 2018. ^ "Flight times - Iberia". Retrieved August 4, 2018. ^ "Japan Airlines Timetables". Retrieved August 4, 2018. ^ "JetBlue Airlines Timetable". Retrieved August 4, 2018. ^ a b "Flight Status - LATAM Airlines". Retrieved August 4, 2018. ^ "California Flight Schedule". Mokulele Airlines. ^ "Norwegian Air Shuttle Destinations". Retrieved August 4, 2018. ^ "Qantas Timetables". Retrieved August 4, 2018. ^ "Timetable - SAS". Retrieved August 4, 2018. ^ "Sichuan adds Jinan – Los Angeles service from Dec 2016". Routesonline.com. Retrieved November 1, 2016. ^ "Flight schedules". Retrieved August 4, 2018. ^ "Pittsburgh Flights Cut". Retrieved 18 April 2019. ^ "Check Flight Schedules". Retrieved August 4, 2018. ^ "Spirit Group optimizes hub management of the network airlines and prepares for moderate growth in early 2019". Retrieved November 14, 2018. ^ "Where We Fly". Retrieved August 4, 2018. ^ "Sun Country Airlines". Retrieved August 4, 2018. ^ "Timetable - Thomas Cook Airlines". Retrieved August 4, 2018. ^ a b "Timetable". Retrieved August 4, 2018. ^ May 30, 2018 by Tom Otley (May 30, 2018). "Virgin Atlantic announces direct service from Manchester to Los Angeles – Business Traveller". Businesstraveller.com. Retrieved November 17, 2018. ^ "Interactive flight map". Retrieved August 4, 2018. ^ "Flight Timetables | Virgin Australia". Retrieved August 4, 2018. ^ "Volaris Flight Schedule". Retrieved August 4, 2018. ^ "Route Map". Retrieved August 4, 2018. ^ "Our Stations « AeroUnion". AeroUnion. Retrieved April 25, 2016. ^ "News Content". Lawa.org. Retrieved April 25, 2016. ^ "Air China Cargo Co., Ltd". Air China Cargo. Retrieved April 25, 2016. ^ a b "Aloha Air Cargo leasing an ABX Air freighter for LAX flights". ch-aviation. Retrieved April 25, 2016. ^ "Welcome To Asiana Cargo". Asiana Cargo. Archived from the original on May 25, 2017. Retrieved July 8, 2016. ^ "CARGOLUX AIRLINE Los Angeles CA, 90045 – Cortera Company Profile". Cortera. Retrieved April 25, 2016. ^ "Cargolux Airlines International". Airport-LA. Retrieved April 25, 2016. ^ "Cathay Pacific expands cargo presence in the Americas with new freighter service to Portland". Cathay Pacific. Archived from the original on August 17, 2016. Retrieved July 14, 2016. ^ "Network – Cathay Pacific Cargo". Cathay Pacific Cargo. Retrieved April 25, 2016. ^ "China Airlines Cargo Services". China Airlines. Archived from the original on May 17, 2016. Retrieved April 25, 2016. ^ "China Airlines Cargo Services". China Airlines. Retrieved April 25, 2016. ^ "China Airlines Service". China Airlines Cargo. Archived from the original on June 27, 2015. ^ "China Cargo Airlines in Los Angeles , CA". Yellow Pages. ^ "China Southern Airline Cargo". Citysearch. Retrieved April 25, 2016. ^ "Cargo-China Southern Airlines Co. Ltd csair.com". China Southern Airlines. Retrieved April 25, 2016. ^ "China Southern Cargo". Sky Team Cargo. Archived from the original on September 24, 2015. ^ "Atlas Air Worldwide Holdings". Atlasair.com. September 18, 2015. Retrieved April 28, 2016. ^ "Polar Air Cargo". Polar Air Cargo. September 18, 2015. Retrieved April 28, 2016. ^ "Polar Air Cargo". Polar Air Cargo. September 18, 2015. Archived from the original on April 26, 2016. Retrieved April 28, 2016. ^ "Polar Air Cargo" (PDF). Polaraircargo.com. September 18, 2015. Retrieved April 28, 2016. ^ "Media". Emirates SkyCargo. Retrieved April 25, 2016. ^ "A-Z Air Freighters Guide – Emirates SkyCargo (EK/UAE/176)". Azfreighters.com. Retrieved April 25, 2016. ^ "EVA Air Cargo". Eva Air Cargo. Retrieved April 25, 2016. ^ "Korean Air cargo LAX 6101 W Imperial Hwy Los Angeles, CA Airline Companies". MapQuest. September 18, 2015. Retrieved April 28, 2016. ^ "▒▒ Korean Air Cargo - To be a respected leader in the world airline community ▒▒". Cargo.koreanair.com. September 18, 2015. Retrieved April 28, 2016. ^ "LUFTHANSA CARGO AG Los Angeles CA, 90045 – Cortera Company Profile". Cortera. April 25, 2016. Retrieved April 25, 2016. ^ "Statistical Data - Air Cargo - Chubu Centrair International Airport, Nagoya". Centrair. ^ "NCA – Nippon Cargo Airlines – Contact Us". Nippon Cargo Airlines. Retrieved April 25, 2016. ^ "NCA – Nippon Cargo Airlines – Flight Schedule". Nippon Cargo Airlines. Retrieved April 25, 2016. ^ "Qantas : Los Angeles Freight Terminal : Restrictions" (PDF). Qantas.org. September 18, 2015. Archived from the original (PDF) on March 15, 2016. Retrieved April 28, 2016. ^ "Qatar Airways Cargo to launch service to Los Angeles". Air Logistics Group USA. July 6, 2013. Retrieved April 25, 2016. ^ "Qatar Airways to launch freighter service to Los Angeles". joc.com. July 6, 2013. Retrieved April 25, 2016. ^ "Qatar Airways Cargo to launch freighter services to LAX". L.A. Biz. March 18, 2015. ^ "SINGAPORE AIRLINES CARGO FLIGHT SCHEDULES". ^ "North Carolina's SkyLease Cargo applies for Hong Kong rights". ch-aviation. July 6, 2013. Retrieved April 25, 2016. ^ "Western Global secures 3-year Flexport contract". ch-aviation. March 7, 2018. Retrieved March 11, 2018. ^ "Cargo Traffic 2006 FINAL". Airports Council International. July 18, 2007. Archived from the original on September 29, 2007. Retrieved February 24, 2008. 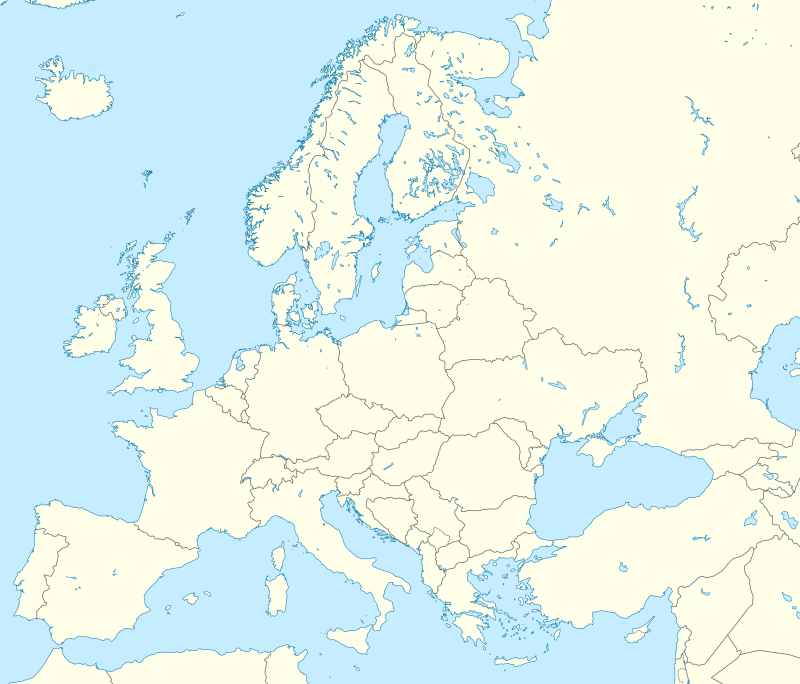 ^ "Airport Information – Statistics". Los Angeles World Airports. Retrieved February 12, 2015. ^ "RITA | BTS | Transtats". transtats.bts.gov. Retrieved June 15, 2018. ^ "Bureau of Transportation Statistics" (PDF). U.S. Department of Transportation. January 2017. Retrieved December 16, 2018. ^ Nguyen, John (February 25, 2015). "LAX Just Got Better: Airside Connector to International Terminal Opens (Video)". Airline Reporter. Retrieved April 10, 2016. ^ Erskine, Chris (March 19, 2019). "Long-term Lot C at LAX about to close, replaced by Lot E near Proud Bird". Los Angeles Times. Retrieved 2019-03-19. ^ "Airport Shuttle Bus". China Airlines. March 15, 2016. Archived from the original on March 6, 2016. Retrieved April 28, 2016. ^ "Officials touted 2.25-mile LAX Automated People Mover at groundbreaking". Daily Breeze. March 14, 2019. Retrieved 2019-03-16. ^ "LAWA Official Site | ConnectingLax". Lawa.org. Retrieved March 16, 2018. ^ a b Sharp, Steven (December 8, 2017). "LAX Takes First Step Toward Construction of $5.5-Billion Landside Access Modernization Project". Urbanize LA. Retrieved March 16, 2018. ^ a b c Sharp, Steven (February 16, 2018). "Renderings Galore for the LAX Automated People Mover". Urbanize LA. Retrieved March 16, 2018. ^ "Airport Metro Connector" (PDF). LACMTA. August 2015. Retrieved February 2, 2016. ^ Nelson, Laura J. (June 26, 2014). "Train station to connect Metro rail lines with LAX approved". Los Angeles Times. Retrieved May 25, 2015. ^ Weikel, Dan. "Light rail plan for Los Angeles International Airport advances". LA Times. LA Times. Retrieved December 18, 2012. ^ "Three Firms Have Submitted Bids to Build a People Mover at LAX - NBC Southern California". Nbclosangeles.com. November 10, 2017. Retrieved March 16, 2018. ^ "News - Connecting LAX". Laxishappening.com. Retrieved March 16, 2018. ^ on (July 17, 2017). "RFP for LAX People Mover | Airports International | The Airport Industry online, the latest airport industry news". Airports International. Retrieved March 16, 2018. ^ Laura J. Nelson (April 11, 2018). "City Council approves long-awaited people mover to LAX - Los Angeles Times". Latimes.com. Retrieved November 17, 2018. ^ "Dallas firm awarded $336 million contract for shuttle station build at LAX". Internationalairportreview.com. January 24, 2018. Retrieved March 16, 2018. ^ "'Preferred developer' named for Los Angeles airport rail project". Trains Magazine. January 29, 2018. Retrieved January 29, 2018. ^ "Officials Break Ground On $5.5 Billion People Mover At LAX". CBS Los Angeles. March 14, 2019. Retrieved 2019-03-15. ^ Martin, Hugo (March 1, 2019). "Airports feared losing revenue to Uber and Lyft. Here's what happened". Los Angeles Times. Retrieved 3 March 2019. 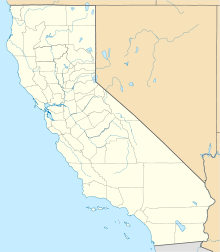 ^ "Coast Guard's move to Point Mugu now permanent". ^ Parker, Dana T. Building Victory: Aircraft Manufacturing in the Los Angeles Area in World War II, pp. 6, 17, 19, 26, 34, 48, 80, 91, 92, Cypress, CA, 2013. ISBN 978-0-9897906-0-4. ^ Parker, Dana T. Building Victory: Aircraft Manufacturing in the Los Angeles Area in World War II, pp. 11-25, Cypress, CA, 2013. ISBN 978-0-9897906-0-4. ^ "Flight Path Learning Center (official site)". Retrieved February 25, 2008. ^ "About LAWA". Los Angeles World Airports. Retrieved on September 28, 2011. "Los Angeles International Airport 1 World Way, Los Angeles, CA 90045"
^ "Continental Airlines to Move Its Main Offices Here From Denver". Los Angeles Times. August 16, 1962. B11. Retrieved on January 24, 2010. ^ "AIRLINE OCCUPIES NEW HEADQUARTERS IN L.A." Los Angeles Times. September 15, 1963. Section J, page N6. Retrieved on January 24, 2010. ^ "Westchester – Mapping L.A." Los Angeles Times. Retrieved on March 19, 2010. ^ "The Company" (). Continental Airlines Magazine. July 2009. Retrieved on February 8, 2010. ^ "Insurer to Buy Continental Stock". Associated Press at Toledo Blade. Wednesday March 16, 1983. Page 4. Google News 3 of 52. Retrieved on August 22, 2009. ^ "World Airline Directory". Flight International. March 30, 1985. 131". Retrieved on June 17, 2009. "Head Office: PO Box 92005, World Way Postal Center, Los Angeles International Airport, Los Angeles 90009, United States". ^ "World Airline Directory". Flight International. March 30, 1985. 83". Retrieved on July 23, 2009. "7401 World Way West, Los Angeles International Airport, California 90009, United States"
^ All incidents listed here are in the Aviation Safety Network LAX database, unless otherwise noted. ^ Huston, John W., Major General, USAF, Ret., editor, "American Airpower Comes of Age: General Henry H. "Hap" Arnold's World War II Diaries; Volume 1", Air University Press, Maxwell AFB, Alabama, January 2002, Library of Congress card number 2001041259, ISBN 1-58566-093-0, page 88. ^ Matthews, Birch, "Cobra! : Bell Aircraft Corporation 1934–1946", Schiffer Publishing Limited, Atglen, Pennsylvania, 1996, Library of Congress card number 95-72357, ISBN 0-88740-911-3, pp.112–113. ^ Swanborough, Gordon, and Bowers, Peter M., "United States Navy Aircraft since 1911", Naval Institute Press, Annapolis, Maryland, 1976, Library of Congress card number 90-60097, ISBN 978-0-87021-792-0, pp.487. ^ Waag, Robert, "NA 73 – The Forgotten Mustang", Airpower, Granada Hills, California, November 1971, Volume 1, Number 2, p. 9. ^ Editors, "Mustang", Airpower, Granada Hills, California, July 1985, Volume 15, Number 4, p. 12. ^ Mizrahi, Joseph V., "Airmail", Wings, Granada Hills, California, December 1985, Volume 15, Number 6, p. 5. ^ "October 1944 USAAF Stateside Accident Reports". Aviationarchaeology.com. Retrieved August 13, 2013. ^ "P-51 Mustang". Ub88.org. Retrieved August 13, 2013. ^ Jonathan B. Tucker (2000). Toxic Terror: Assessing Terrorist Use of Chemical and Biological Weapons. MIT Press. p. 77. ISBN 978-0-262-70071-9. 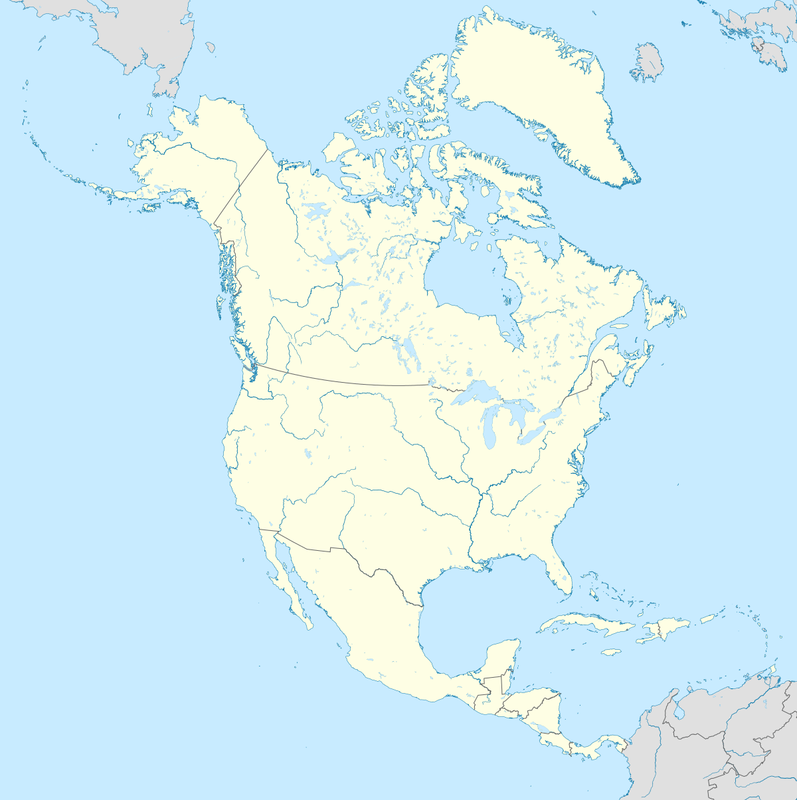 ^ Federal Aviation Administration (February 1, 1991). "Lessons Learned". Lessonslearned.faa.gov. Archived from the original on March 5, 2017. Retrieved February 28, 2017. ^ "Runway collision of USAir Flight 1493, Boeing 737 and Skywest Flight 5569 FairChild Metroliner, Los Angeles International Airport, Los Angeles, California, February 1, 1991" (PDF). Fss.aero/accident-reports. Retrieved February 28, 2017. ^ U.S. Court of Appeals for the Ninth Circuit (February 2, 2010). "U.S. v. Ressam" (PDF). Archived from the original (PDF) on October 4, 2012. Retrieved February 27, 2010. ^ "Complaint; U.S. v. Ressam" (PDF). NEFA Foundation. December 1999. Archived from the original (PDF) on March 1, 2012. Retrieved February 26, 2010. ^ "Ressam Testimony in Mokhtar Haouari Trial". Southern District of New York. July 2001. Retrieved February 27, 2010. ^ "'Millennium bomber' sentence overturned; feds seek longer one – CNN.com". CNN. February 2, 2010. Retrieved May 11, 2010. ^ "ASN Aircraft accident McDonnell Douglas MD-83 N963AS Anacapa Island, California". Aviation Safety Network. July 26, 2004. Retrieved March 13, 2008. ^ Feldman, Charles (September 5, 2008). "Federal investigators: L.A. airport shooting a terrorist act". CNN.com. Archived from the original on February 1, 2008. Retrieved March 13, 2008. ^ "ASN Aircraft accident Airbus A320-232 N536JB Los Angeles International Airport, California". Aviation Safety Network. October 7, 2005. Archived from the original on October 20, 2007. Retrieved March 13, 2008. ^ "Third Annual Archie League Medal of Safety Award Winners: Michael Darling". NATCA. Archived from the original on July 2, 2007. Retrieved March 13, 2008. ^ "NTSB incident report. NTSB identification OPS07IA009A". National Transportation Safety Board. Archived from the original on September 29, 2007. Retrieved March 13, 2008. ^ Staff (September 2007). "Outgoing FAA Administrator Marion Blakey: LAX Must Address Runway Safety". Metro Investment Report. Archived from the original on July 20, 2011. ^ a b Alsup, Dave (October 16, 2013). "Police: Arrest made in Los Angeles airport dry ice explosion". CNN. Retrieved October 16, 2013. ^ Abdollah, Tami (October 16, 2013). "AP Newsbreak: Arrest in LA airport ice explosions". Associated Press. Archived from the original on October 16, 2013. Retrieved October 16, 2013. ^ Winton, Richard (October 16, 2013). "LAX dry ice explosions: Airport employee arrested in case". Los Angeles Times. Retrieved October 16, 2013. ^ Abdollah, Tami (October 18, 2013). "Official: 2nd LAX worker also set off dry ice bomb". Associated Press. Archived from the original on October 19, 2013. Retrieved October 19, 2013. ^ "TSA Agent Reported Shot at LAX; Major Police Response". KTLA TV. Retrieved November 1, 2013. ^ "Passengers evacuated from terminal at Los Angeles International Airport after reports of gunshots". Fox News. Retrieved November 1, 2013. ^ Helsel, Phil. "False Reports of Gunfire Cause Chaos at Los Angeles Airport". nbcnews.com. NBC News. Retrieved August 29, 2016. ^ "Aeromexico plane collides with utility truck at LAX, injuring 8". BNO News. May 20, 2017. ^ "LAX Specific Plan Amendment" (PDF). Archived from the original (PDF) on June 12, 2011. Retrieved December 6, 2010. ^ Russell, Edward (December 19, 2014). "America's second busiest airport LAX plans $5bn expansion". Flightglobal.com. Archived from the original on December 24, 2014. ^ Weikel, Dan; Elmahrek, Adam (December 29, 2016). "LAX had a nightmarish holiday season of delays and gridlock. It's likely a preview of the airport's growing pains". Los Angeles Times. Retrieved December 30, 2016. ^ Tony Barboza (January 22, 2007). "L.A. airports fly high with film shoots". Los Angeles Times. 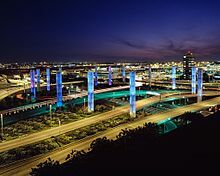 Wikivoyage has a travel guide for Los Angeles International Airport. This page was last edited on 19 April 2019, at 11:16 (UTC).